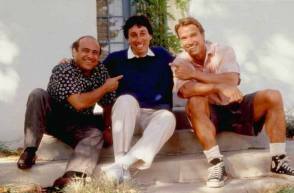 This photo was taken on the set of the film Twins (1988). 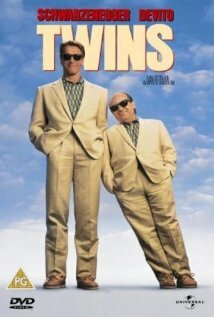 It is an American comedy film produced and directed by Ivan Reitman about unlikely twins (played by Arnold Schwarzenegger and Danny DeVito) who were separated at birth. The actor Danny Devito (left), director Ivan Reitman (middle) and actor Arnold Schwarzenegger (right) are posing for this picture.